Tomorrow is the second meeting of the DD Systems Task Force in Washington State. This task force was created from legislation SSB 5459 in 2011 which closed one of our states Residential Habilitation Centers (RHCs) and denied access to services for those under 21. This task force is faced with the task of reporting to the legislature in December 1, 2012 and they are just now getting underway. This tack seems overwhelming to me. I would love to attend this meeting but I work. As in most every other decision that has been made regarding the lives of our most vulnerable citizens, the decision are made by those who do not work or live with these individuals. The decision makers are people who work in other areas of DD advocacy and part of their job is to go to these meetings and hearings. They are paid to attend, have their travel expenses paid and probably a per diem. The advocates who are the experts in caring for our most vulnerable citizens and who understand the intense support needs are either busy caring for their loved ones or work in other jobs – jobs that do not allow them the freedom to travel to Olympia to be involved in advocating for our most vulnerable. This imbalance contributes to our crisis situation. On this panel, there is one person who is not a paid advocate. She has to pay her own way to these meetings and she has to travel across the state. I believe all others are able to attend as part of their jobs. Is this really an evenly balanced membership? I am unable to attend the meeting on September 6 but would like to submit the following comments and concerns regarding the future use of our Residential Habilitation Centers. I am an advocate for a continuum of care which means that I believe we need to have a place for safe, stable, sustainable and cost effective support for all levels of support care needs of our most vulnerable citizens. A continuum of care means that I advocate for all levels – from the most intensive support care needs at the RHC to community homes to family homes. We cannot exclude one group based on support needs or age but must find a way to address the spectrum of needs and a continuum of care system does just that. The main two issues that I would like to address are that of acuity (support needs) and age of clients. 1. The report entitled “Assessment Findings for Persons with Developmental Disabilities Served in Residential Habilitation Centers and Community Settings” has some excellent information in it. The problem with this report is that the authors wrote “key findings” which are not supported by the data in the report. They also incorrectly combined the three environments which were studied and into two environments to report the “key findings.” My comments and concerns regarding this report which is often referenced are attached. In addition I have attached charts which look at the data in this report. From these charts, it is clear to see that the support needs of the those in the RHC are significantly higher than those in community or “other” residential settings. 2. In reviewing the Certified Residential Providers Cost Reports submitted each year to the Division of Developmental Disabilities I have made a graph of the acuities and costs from these reports. It is clearly evident that the acuities (as reported as resident hours per day) in the community homes are much lower than the acuities of the residents in the RHCs. One reason for this is the number of residents who have high acuity levels in 3 or more assessed areas of support. 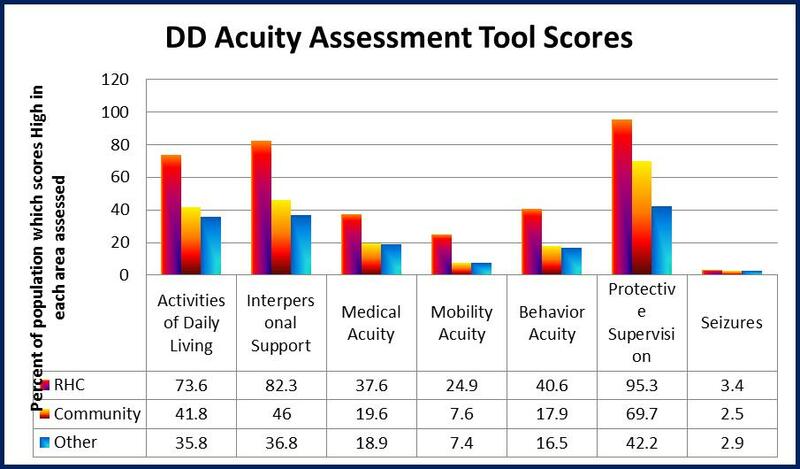 When measuring acuity in 7 areas of care, there is a major difference between a person who has high acuity in 1 area and low in 6 areas and a person who scores high in multiple acuity areas. This fact is not addressed in the report by Lucenko and He but by looking at the data they present I have been able to get a rough estimate of the number of residents who rank high in 3 or more areas. The results of this are staggering and one can see the significant difference between the residents in the RHC and the residents in community residential settings. Each additional area in which a resident scores “high” can exponentially increase the level of support care needs for that individual. 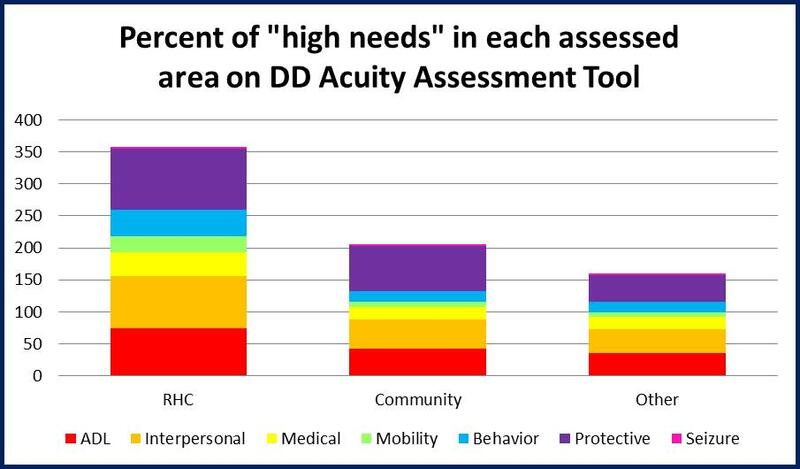 Yes, there are many who live in the community who score “high” on at least one area assessed but for those who score “high” in 3 or more assessed areas, their care may be best addressed in the RHC – a facility which provides more stable and sustainable care and is cost effective for these high support needs individuals. 3. As the acuity levels increase, the cost of care to safely care for these individuals increases too. This fact is evident in the information that the providers submit to DDD for reimbursement. 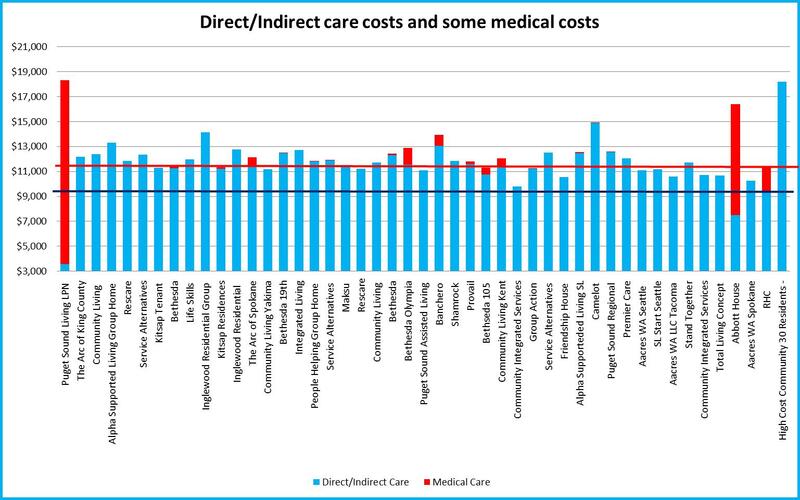 Please see the attached information entitled “Cost of Care for 2011 for DD Task Force.” It documents the cost and the reported acuity level of the residents in each facility. 4. 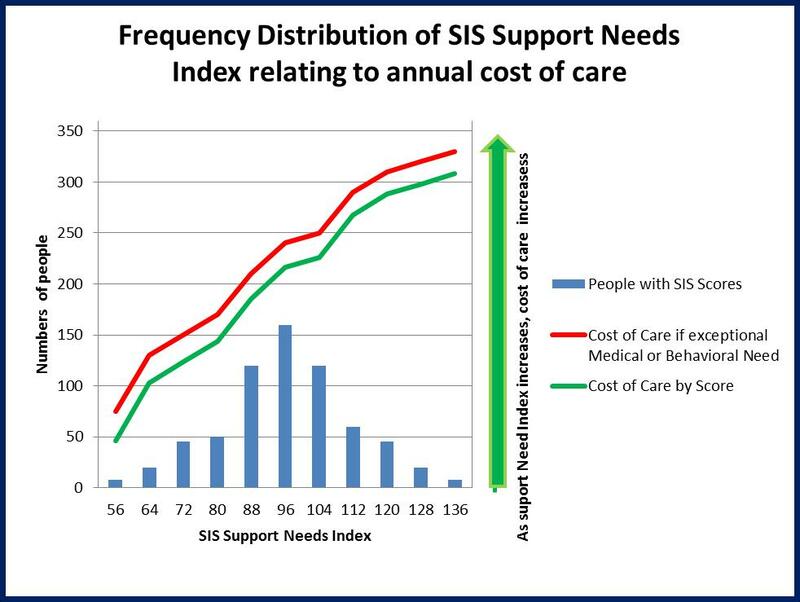 The increased cost of care is documented in the Support Intensity Scales data. This is measured in the section entitled “Exceptional Support Needs”. Graph on attached document. I am greatly disturbed by SSB5459 which passed into State Law discrimination against our youth who may need the level of support services only provided in the RHCs. I can find no mention of limiting support services by age in either the US DD Act or the 1999 US Supreme Court Decision Olmstead which would support such discrimination. In regards to the Federal Home and Community Based Service Waivers, these are set up to allow for choice to not live in an institution and to promote community care. The states may have choices to limit waivers to certain groups or populations but I do not see information from CMS which allows a state to deny those under 21 the supports services needed in the ICF/ID or that the ICF/ID has a federal age requirement for admission. (See attached document regarding ICF/ID services) When there are no community alternatives for one under 21 who may need these support services and the person is denied long term admission to the RHC, where is this person supposed to go? The issue is not if these services are available, they are – the issue is denying these services to those under 21 only due to the fact of this person’s age. Former Secretary of the Department of Social and Health Services, Susan Dreyfus, responded to my question regarding this issue with “they still have a choice – they can send their child out of state.” Why, when we have the appropriate services right here in our state would we choose to send our children to other states to receive the same service? Below are some excerpts from the HCBS Waiver applications and contracts which refer to choice. These individuals have been assessed to have the level of care support needs of the RHC but are not given the choice to utilize those services. Currently, I am working with a family who has an 18 year old boy at Fircrest. They family has requested that he receive long term placement at Fircrest given his intense support care needs and having no safe alternative in a community setting for him. He had been on the CIIBS waiver until his recent short term admission for crisis care at Fircrest. The family has looked at over 8 community placements and with each setting there would be significant problems regarding safety for this individual. These issues range from close proximity to busy streets (this boy has a history of elopement and is very fast and strong) to high staffing turnover (up to rates of 49% in community residential homes) which would significantly put this young man at risk given the fact that he is non-verbal, aggressive, has PICA, does not sleep through the night and has to be moving constantly. Since being on a short term stay at Fircrest, this boy has improved with his sleep patterns and behavior and has met the short term goals. The reason he has met these goals is because he has the support staff that he needs to be successful at Fircrest. This issue of support needs is often misunderstood. This does not mean that now this boy is “cured” and he can return to his old environment and he will maintain the skills that he has accomplished at Fircrest. This means that in order to be successful, he needs to have these supports in place. Without these supports his life is at risk. I would really like to emphasize this fact of support needs. These individuals are not individuals who will learn a skill then go on their way. These are individuals who will need to have these supports throughout their lives. It is the level of supports which are stable and sustainable that enables these individuals to be successful and contributing members of our community. Removing these supports puts their lives at risk. Please take into consideration these issues when looking at the DD System of supports and the role of the RHC in that system. I believe that the RHC is a critical part of the continuum of care service model which is a model that can best serve ALL citizens with developmental and intellectual disabilities. 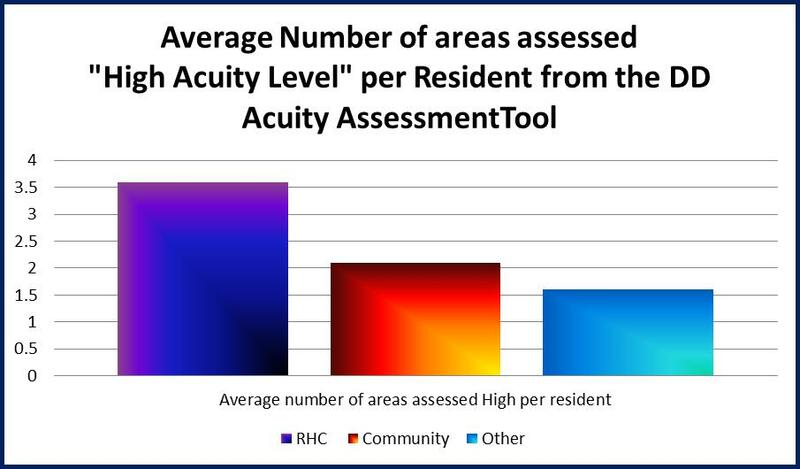 This means that each resident, on average, scores high in 3.6 (RHC), 2.1 (Community) and 1.6 (Other) areas assessed. Each additional “high” score greatly increases the overall support needs of that client. These areas need to be looked at as a “whole” and from this picture, it is clear that on a “whole”, the average RHC resident has a significantly higher support need than the average community or “other” resident. These “exceptional needs” score only mean that for the same score assessed, these are exceptional and the cost of care for these individuals will run higher than a person without this “exceptional needs” score. 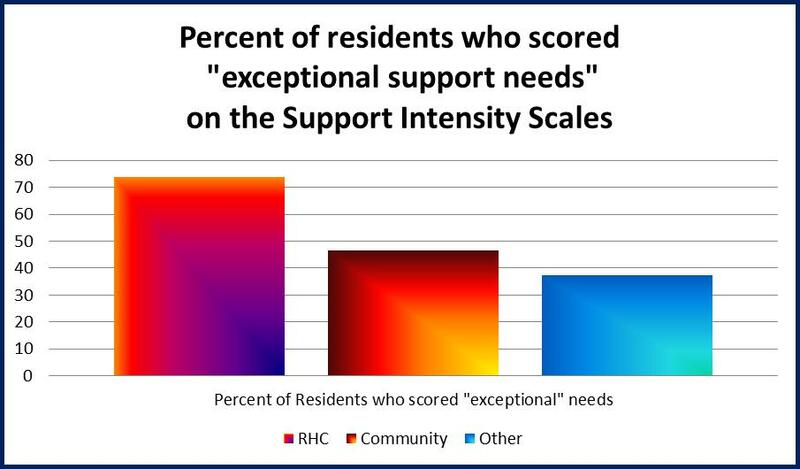 One can see that the residents in the RHC have higher “exceptional needs” than those in community or other. This entry was posted in Continuum of Care, Family Issues and Stories, Health, Safety and Medical Issues, ICF/DD, Intellectual Disabilities and tagged DD Service Systems Task Force, DDSSTF, Department of Social and Health Services (DSHS), Developmental Disabilities Service System Task Force, Direct Care Professionals/Home Care, Reports and Publications, RHC Bill, RHC Task Force, SSB 5459.